Just over two years ago I wrote a post about the Fiat Trepiùno concept car and mused a bit about cultural influences on design. Design thinkers are particularly adept at reaching a point of empathy for users, but I do think that one's own sense of culture and surroundings does -- and in most cases should -- end up embedded in the offerings one design. In other words, designers of small cars should live in cities. Hummer designers should hang out in shopping malls. And suburban pickup designers should hang out at Home Depot. The good news is that Fiat is shipping the Trepiùno as the new Fiat 500. It is to the great Dante Giacosa's Fiat Nuova 500 what the New Beetle is to Professor Porsche's original Beetle -- a retro reskin of a modern front-wheel drive platform; an exercise in style more than in the extreme engineering packaging and rational beauty that characterized the originals. But hey, I'll take it -- the iconic 500 look (inspired by the Isetta, a descendant of refrigerators, by the way), is just such a winner. 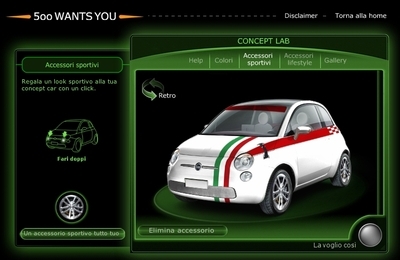 On to the marketing bit: lifting a page from Ducati and Virgin, but on a much grander scale, Fiat has set up www.fiat500.com, where you can go "design" your new Fiat 500 as I did above. Of course, you're not really designing it -- you're just optioning it out with lifestyle and go-fast-boy-racer accessories, a la Mini. But it's fun, it's good for getting some buzz out, and if Fiat is clever, they'll be data mining the results to guide their manufacturing production mix. Clever.